How Long Will it Take to Watch to Watch the Whedonverse? So the stats-addicted people over at Nielsen decided to do some very important number-crunching and made a handy-dandy guide to TV Marathons of different shows. According to them watching the full season of Firefly would take 10 hours and the full series of Buffy would take 4 days, 9 hours. Check out Nielsen's full Binge-watching post which includes many other types of shows (including Supernatural) here. 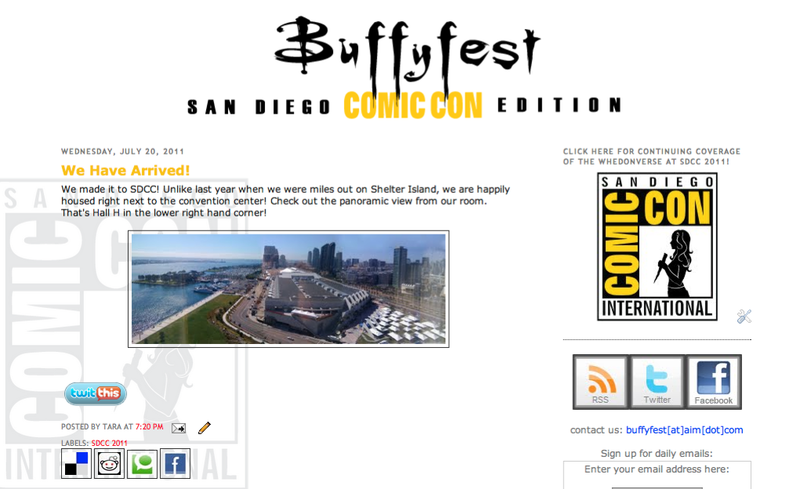 Buffyfest Back In Effect…Site Re-Launch! It's been almost 8 years to the day since we started the concept of Buffyfest with our annual parties. The blog was launched a couple of years later in 2008 and we can admit now we had no clue what we were doing. Blogs were fairly new and we never intended to have any readership other than the three of us, so it's popularity and accolades surprised us. Buffyfest has had some major ups. Some highlights include: Meeting Joss Whedon and a whole host of actors and creators from the Whedonverse, our very first interview, all the fabulous parties and events, being able to contribute to wonderful causes like Can't Stop the Serenity, the many fun conventions we're covered, and of course, the inside info we get from the wonderful people over at Dark Horse and it's master: Super Scott Allie. Fast forward to today and after a few months of hiatus, we're happy to announce a re-launch of Buffyfest that will roll out over the next month or so. You can expect some exciting announcements and we are so excited to be gearing up for San Diego Comic Con 2014, which we'll be attending at the end of July. And for long-time readers, you'll also notice that we're back in black. It just felt right to take it back to our roots. We'll leave you with this: Buffyfest's official Theme Song. An oldie, but goodie.